Trying to join two pieces of metal together requires a specialized welding process where heat combined with small metal beads or wire create a liquid stream of metal that can be channeled into the gap between the two pieces of metal and effectively “glue” them together. While there are several types of welding processes, the process most regularly used by both industrial fabricators and hobbyists alike is MIG Welding. MIG welding, which stands for metal inert gas welding, is a process that uses a continuously-fed spool of wire and a MIG welding gun to burn, melt and fuse together two pieces of metal. The process is also sometimes referred to as Gas metal arc welding (GMAW). MIG welding originated in the 1940’s as a process for welding aluminum. During the 1950’s and 1960’s, developments in the use of semi-inert gases opened up further uses for the process in heavy industrial processes for aluminum and steel. Because of its versatility and the relative ease of learning it, MIG welding has become the preferred welding process for indoor industrial uses. The MIG welding process consists of using consumable wire that is fed from a spool through to the joint in the metal that you want to weld together. This is done using a MIG welding gun fueled by an inert gas to produce a high-heat arc to melt the wire feed into a bead on the joint. Moving the welding gun down the joint at an appropriate speed creates a tight, smooth joint weld. For steel, there are two common wire types. Use an AWS classification ER70S-3 for all-purpose welding. Use ER70S-6 wire when more deoxidizers are needed for welding on dirty or rusty steel. As for wire diameter, .030-in. diameter makes a good all-around choice for welding a wide range of metal thicknesses in home and motorsports applications. For welding thinner material, use a .023-in. wire to reduce heat input. For welding thicker material at higher total heat levels, use .035-in. (or .045-in. wire if it's within your welder's output range). In order to operate a MIG welding machine, a shielding gas source is necessary in order to shield the area from the nitrogen and oxygen commonly found in the atmosphere which can interfere with the quality of the weld. There are essentially 2 types of gases used in MIG welding. A 75 percent argon/25 percent CO2 blend (also called "75/25" or "C25") works as the best "all-purpose" shielding gas for carbon steel. It produces the least amount spatter, best bead appearance and won't promote burn-through on thinner metals. 100 percent CO2 provides deeper penetration but also increases spatter and the bead will be rougher than with 75/25. Most MIG welding machines will allow you to select the wire diameter you are going to use and then dial in the thickness of the metal that you plan to weld, which will then allow the machine to automatically select the proper voltage and amperage and wire-feed speed for your project. Select the right MIG welding method. The MIG welding method you use will depend greatly on where the metal you plan to weld is located. Holding the welding gun at a 90-degree angle to the metal workpiece, you want to direct the filler metal straight into the joint. Use a slight back and forth motion to fill larger gaps. The most common type of weld is a T-joint, or what is known as a “fillet weld”. keep the gun at a 45-degree angle and make multiple weld passes to create an even weld bead and avoid undercuts. When your metal workpiece is located horizontally in front of you, you will want to adjust your welding gun angle by 0-1 to 15 degrees so that you avoid the filler metal rolling over the bottom side of the weld joint. If your metal workpiece is thick metal or the fit-up is poor, you may want to use weave beads to fill the weld joint and ensure the proper tie-in of the weld to the base metal. Vertical MIG welding can be tricky because you are fighting gravity as you weld. You may want to reduce the voltage and amperage by 10 to 15 %. If you are welding thin metals, you will want to weld vertically down so you can avoid excessive melt-through. Begin at the top of the joint and weld down and direct the wire away for the weld puddle. For thicker metals, you will want to weld vertically up. Begin at the bottom of the joint and drag the welding gun up using a slight weaving motion to help control the size and shape of the weld puddle. The overhead welding position can be one of the most difficult welding positions because you are fighting both gravity and the welding gun speed. You will want to lower the voltage and amperage and use a smaller diameter wire to help keep the weld puddle small. Make sure to drag or push the welding gun fast enough so that the weld metal does not fall out of the joint. The MIG welding process offers many, many benefits; however there are some drawbacks that welders will want to be aware of in deciding what welding process to use for their project. MIG welding is a fairly simple and easy process to learn compared to other types of welding. MIG welding is very versatile and can be used for a wide range of metal thicknesses and allows you to weld a variety of materials such as mild steel, nickel, stainless and aluminum. 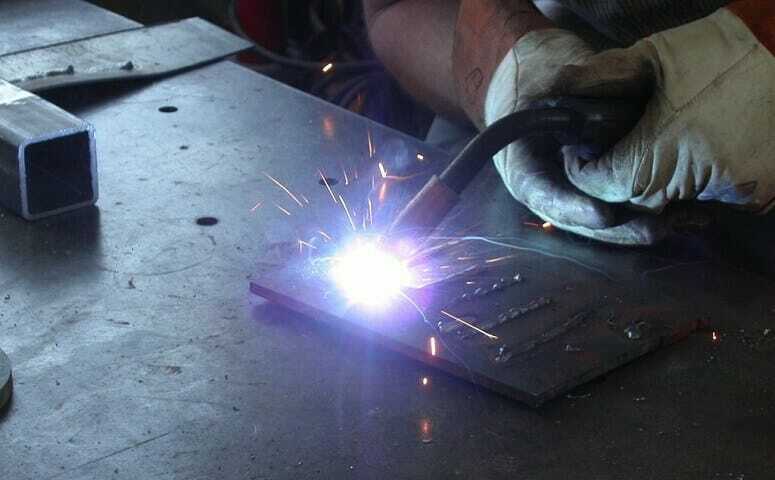 High-quality welds can be produced with the MIG welding process because it does not use a flux. So there is little risk of slag being trapped in the metal weld. Of all the welding processes, MIG welding is probably the safest as the gas shield protects the arc and only minor weld spatter is produced. MIG welding has a high heat input and is not an ideal process to use for vertical or overhead welds due to the possibility of undue melt-throughs. The MIG welding equipment setup involves a lot of complex pieces including a welding gun, a shielded gas supply, a constant power supply, a wire feeding system and a source of cooling water. Before attempting any welding project, you need to make sure you have the proper safety apparel and any potential fire hazards are cleared from the welding area. Basic welding safety apparel includes leather shoes or boots, cuffless full-length pants, flame-resistant long sleeve jacket and leather gloves, a welding helmet, and safety glasses to protect your body and head from metal sparks and spatter. Use a metal brush and clean down to bare metal before striking an arc. Make sure your work clamp connects to clean metal, too; any electrical impedance will affect the wire feed performance. To ensure strong welds on thicker metal, bevel the joint to ensure the weld fully penetrates to the base metal. Before striking an arc, check welding equipment to make sure all of the cable connections are tight and not frayed or damaged. MIG Welding requires DC electrode positive, or reverse polarity. Check the polarity connections on the inside of the machine. Turn on the shielding gas and set the flow rate to 20 to 25 cubic feet per hour. If you suspect leaks in your gas hose, apply a soapy water solution and look for bubbles. If you spot a leak, discard the hose and install a new one. Too much or too little tension on either the drive rolls or the wire spool hub can lead to poor wire feeding performance. Remove excess splatter from contact tubes, replace worn contact tips and liners and discard the wire if it appears rusty. The rate that you move the welding gun along the metal piece will influence the shape and quality of the weld bead. It takes practice to learn to judge the weld puddle size vs. the joint thickness and determine the correct gun travel speed. The weld bead should be no larger than the thinnest section of metal being welded. Welders can be fairly expensive and not all MIG welders are suited for all jobs. Here are our reviews of some of the best. The Hobart 210 MVP MIG Welder 500553 is a nice powerful machine. It can handle up to 3/8 inch thick steel and can operate on either 115-volt or 230-volt input power due to its multi-voltage plug. This portable unit weighs 79 lb and offers 7 output voltage settings and infinite wire feed speed control, so it is super easy to set and adjust for different materials, thicknesses and wire diameters. Hobart’s trademark Spoolrunner spool gun comes optional and adds the capability for aluminum welding and stainless steel. The dual groove driver rolls make it easy to change from one wire diameter to another and the short circuit protection feature protects against current overload. While this is one nice machine, it is on the pricey side. Another drawback is that it has “tap” settings for the power/voltage knob as opposed to some other welders that have the auto-tune infinite adjustment settings feature. On occasion, tap settings can have the tendency to under- or overset. Hobart offers a 5-year warranty on the transformer and stability, 3 years on the drive motors and PC boards and one year on the MIG gun. The Hobart MIG Welder 500553 is a nice light duty machine that will give you portability and serious power when you need it. Few welders would outgrow this machine. The Forney 324 190 AMP welder is a 3-in-1 multi-process inverter machine. It’s capable of doing MIG, Stick or TIG welding. This unit can easily switch between welding processes and is made for use on farms, automotive and boats, home maintenance and repair and light industrial applications. At 43 lbs, the Forney 324 is portable. This unit is so simple to operate and little to no set up is required as it is ready to weld straight out of the box. It comes with an adaptable plug so it can be used with either 230V or 120V input power. The torch has a 10’ lead and features a built-in strain relief which extends the cable life. It features a Euro-style disconnect and is Tweeco compatible. Like most multi-welders, the Forney 324 outputs DC current so it is not suitable for MIG welding aluminum. Additionally, on occasion, the wire feeder has been known to stick. The Forney 324 is a Quality all-in-one unit with a lot of versatility that even a beginner welder will be happy owning. The Longevity MIGWELD 140 has a lot of versatility for a MIG welder and comes with an optional spool gun for aluminum welding. This is a nice heavy welder for home repairs and light-duty fabrication. It can easily connect to an existing 110V input outlet and sets up in no time. The MIGWELD 140 has a welding amperage range of 25-140 amps. It can weld from 24 gauge to ¼ inch thicknesses. Whether you are an experienced or beginning welder, the Longevity MIGWELD 140 is pretty flexible; however it does need some fine tuning to adjust the tensioner now and again in order to maximize performance. The company offers a 5-year warranty. The Longevity MIGWELD 140 is a solid piece of equipment and costs a little less than some other welders in its class. While many MIG welders are portable, you still should have a steady MIG welding cart in order to get the best use out of your machine. The Hotmax Welder Cart WC100 is a sturdy all-steel construction cart which fits most MIG welding machines. This cart can hold up to a 9” diameter tank that weighs less than 55 lbs. It features safety chains to secure shielded gas tanks and an 11 ½” wide top shelf that is plenty deep at 17 ½” deep. It also has an extra storage tray for accessories. It weighs less than 34 lbs and has a pull handle to make this cart easy to move around. While a durable cart, the cart sits relatively low to the ground compared to other welding carts and the assembly can be a little challenging as the holes may not completely line up with the trays and may require some adjustment. Manufactured in China, the cart carries a 1-year limited warranty. 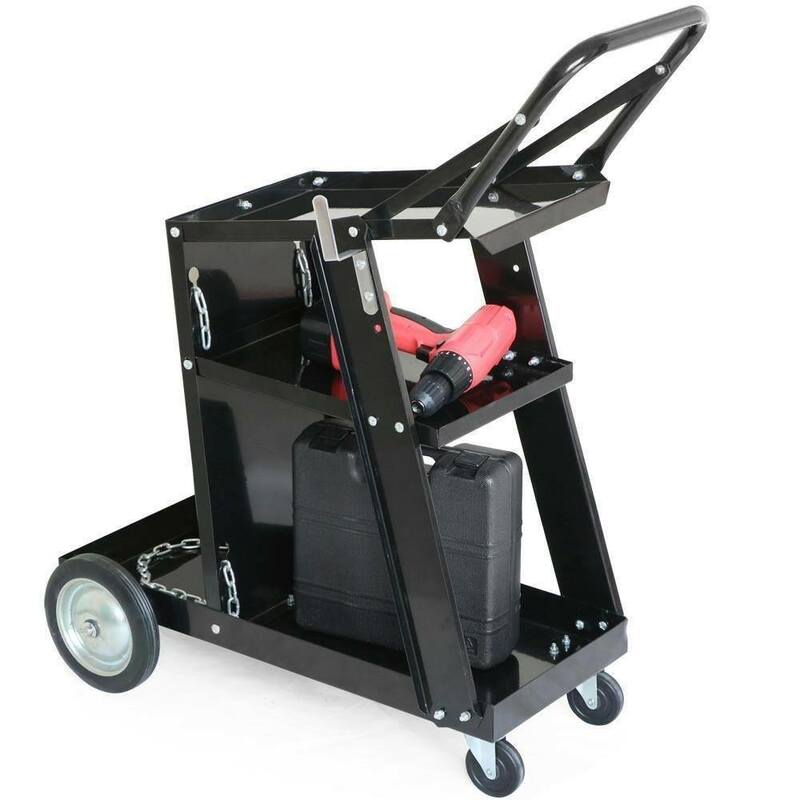 This steel welder cart is designed to handle just about any MIG welder. The Xtreme Power Welding cart is one heavy-duty welding cart, made of durable cast-iron steel with 3 shelves for easy access to supplies and equipment. The top shelf tilts for easy access to welding machine controls and the cart features two safety chains for securing shielded gas tanks. It features heavy mounted caster fixed wheels in the back and swivel wheels in the front. It also has a pull handle, making this cart very maneuverable. The best feature though is the price. With its low price, this cart is a steal. At the same time, it is a little complicated to put together as the directions are not well written and the holes do not always line up so installing shelves can be tricky. Although it may take some effort to assemble, this is a nice little welding cart. The Yaheetech welding cart is a three-tier metal welding cart. The slanted top shelf will hold most brands of MIG welder and puts the welding machine controls within easy reach. The cart is easy to maneuver with stable rubber fixed wheels for stability and two swivel front caster wheels and an easy-to-pull handle. Despite some assembly challenges, this welding cart is an affordable choice for sturdiness and durability. For those individuals interested in learning to MIG weld, there are a number of good resources. Contact local vocational schools and junior colleges, which offer programs in MIG welding. Some local welding supply houses run classes on the weekends for hobbyists. Step by step video learning is a popular resource as well. The video earlier in this article or the one below can serve as a great place to start. MIG Welding is the most basic process of welding and is still considered the standard in industrial welding processes. While not a particularly difficult process to learn, it does require the use of some complex equipment and takes practice to master the different MIG welding positions. By surrounding yourself with the best MIG welding machines and carts and utilizing a variety of sources of MIG welding training resources, anyone can become a skilled MIG welder. Hi, my name is Gregory! I have been welding practically all of my life and love it. As I have gotten older I have started to weld less and less, so in order to continue my love for welding I created this website. I like to write about my experiences and help you all become welders. I hope that you enjoy the site!